Azaleas are flowering shrubs in belonging to the Rhododendron genus and are native to several continents, including Asia, Europe, and North America. Azaleas have been selectively bred by humans for hundreds of years, and there are now over 10,000 different cultivars of this garden favorite. ToGoGarden is pleased to offer Encore Azaleas (with FREE SHIPPING for a limited time), a patented brand of azaleas that blooms multiple times a year! Encore Azaleas not only bring beautiful evergreen foliage to your garden, but they bloom in the spring, summer, and fall. And now is a good time to purchase and plant these azaleas in your garden to enjoy blooms this year between now and first frost, and then again and again, year after year. The Encore Azalea was created by selectively breeding spring-blooming azaleas (the traditional kind) with a rare Taiwanese summer-blooming azalea. Encore Azaleas are recommended for Zones 7 through 10, and they are especially cold-hardy and heat-hardy (a select few varieties can also do well in Zones 6a and 6b). Also thanks to their selective breeding, they are more resistant to disease and pests than traditional azaleas. 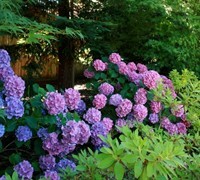 Landscape – The soil underneath pine trees is typically an ideal location for the acid-loving azaleas. Most pine trees have deep roots which won’t interfere with the shallow-rooted azaleas. Choose a pine tree in your yard, and prune the lower branches to permit space, light, and sun to come through to the shrubs underneath (ideally you want a pine tree with a high canopy and some direct sunlight underneath; a good rule of thumb is to have a trunk that is bare and free of braches at least four feet from the ground). Plant azaleas a minimum of six feet from the base of the trunk and avoid large roots. Dig a hole as deep as the root ball and twice as wide. Encore Azaleas must have well-drained soil, so mix in some organic matter (shredded bark, decayed leaves, compost, etc.) with the native soil when covering the root ball (a 50-50 mix is good). Plant with the root ball slightly above soil level (mix an inch or two of organic material in with the soil at the bottom of your hole). Mulch with organic mulch (the best idea is to use pine needles and/or pine chips). Space the plants six feet apart. Companion Plants – Azaleas can be mixed well with other shade-tolerant plants, such as Hosta. 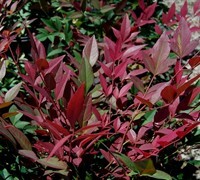 Blueberries also offer colorful foliage in this fall while sharing azalea’s love of acidic soil. Plant some Hellebores to extend the blooming season with late-fall and winter blooms. 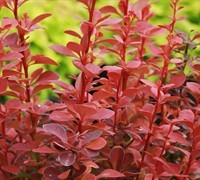 Also, Barberry and a variety of ferns can provide contrasting colors and foliage for your azaleas. Also check out our Encore Azalea Color and Size Chart for more gardening ideas! Optimal Planting Time: Plant Encore Azaleas in the fall. With Encore Azaleas, you will enjoy continued blooms until first frost, and then the roots will continue to grow and develop to produce beautiful new growth the next spring. Sun: Choose a location with full sun to light, filtered shade. 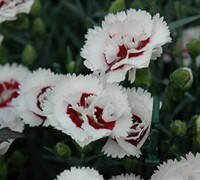 A minimum of 4 to 6 hours of direct sunlight (morning sun is best with afternoon shade) is necessary for proper blooming. They will do okay in full sunlight, but you will need to protect them from heat-related stress conditions such as drought. The two varieties that do the best in full sun are the Autumn Sundance and Autumn Empress varieties. Other varieties prefer some afternoon shade. Soil: Azaleas need acidic soil. You can plant in an acidic area (such as around pine trees) or test the pH of your soil and plan accordingly. Sulfur can be mixed in (3 parts garden sulfur with 1 part iron sulfate applied at the rate of 1 pound per 100 square feet of garden bed) with the soil to bring the pH to the desired range of 5.5 – 6.6. Azaleas also need well-drained, organically enriched soils that get neither too dry nor too soggy. If you have sandy or heavy clay soil, it is vitally important to mix in organic compost or peat moss with the soil. Watering, Care, and Fertilizing: Azaleas need plenty of water, especially during their first year in the ground and during hot summer months. For the first year during the hot summer months, make sure to thoroughly soak the entire root ball every other day, allowing the moisture to seep 8-10 inches deep (this much water is not needed once the roots are established). Well-drained soil is important, because standing water around the roots will cause root rot. Adjust the watering as needed depending on the weather, but the goal is to keep the roots from becoming dry after planting. For the first winter, cover the young azaleas with insulated covering. As they mature, they will need less care. 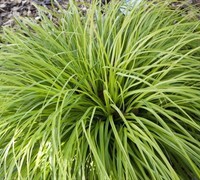 Fertilize once at the beginning of each spring (after the last frost). Size: Encore Azalea varieties can grow between 2.5 to 5.5 feet. Since the plants technically never stop growing, the mature size is not actually a maximum height, but rather a size that can be easily maintained through yearly pruning. Pruning: Encore Azaleas are best pruned once a year after spring flowering. If you wait too late, you may prune off the buds for summer and fall blooming. 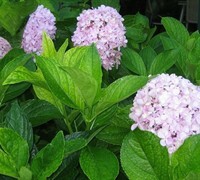 You can also do some shaping while the plants are in bloom, and use the cut branches in indoor flower arrangements. 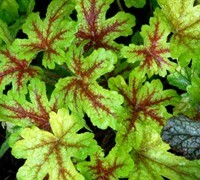 Pests and Disease: Insects and diseases seldom bother healthy, vigorous azalea plants. However, azaleas planted in heavy clay can be susceptible to a soil-borne fungus (Phytophthora) that causes dieback. 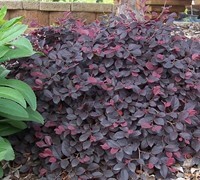 A sure sign of this fungus is a dark reddish brown color at the base of the shrub. The best defense against this fungus is well-drained soil. Azaleas in full-sun may also be plagued by lace bugs which cause mainly cosmetic damage.